Who invented Cigarettes? The history of tobacco dates back hundreds of years but the names of the people most associated with the invention of modern cigarettes are Washington Duke (1820 - 1905) and his son James "Buck" Duke (1856 - 1925). who produced the first commercial cigarettes following the invention of the first cigarette machine by James Albert Bonsack (1859 - 1924) in 1880. Definition of Cigarettes: Cigarettes are defined as finely ground tobacco wrapped in a thin cylinder roll of paper, often with a filter tip, for smoking. 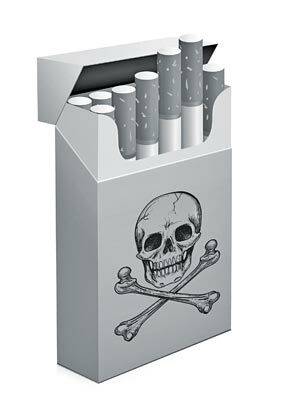 Nicotine is a constitute of tobacco and is the primary additive substance in cigarettes. Various Nicotiana species, commonly referred to as tobacco plants, are cultivated as Nicotiana tabacum and grown worldwide for the production of tobacco leaf for use in cigarettes and other tobacco products. Fact 1: Who invented Cigarettes? Cigarettes were invented by Washington Duke in 1865 during the Second US Industrial Revolution era of inventions (1850 - 1914). Prior to the invention of Cigarettes in 1865, tobacco was either chewed, smoked in pipes or used as snuff, although it was also mixed with different herbs for medicinal purposes. Fact 2: Who invented Cigarettes? Tobacco is derived from Nicotiana is a genus of herbaceous plants and shrubs of the family Solanaceae, that is indigenous to the Americas, south west Africa, Australia and the South Pacific. Fact 4: Who invented Cigarettes? Tobacco was used by the Mesoamericans, the pre-Columbian civilizations, such as the Mayans, Incas and the Olmecs, that flourished before the Spanish colonization of the Americas in the 15th and 16th centuries. Fact 5: Who invented Cigarettes? Archaeological evidence suggests that the Inca people in the Andes region of South American began to cultivate tobacco about 7,000 years ago and began smoking a roll of tobacco leaves tied with a string. Fact 6: Who invented Cigarettes? The Mayan term for smoking rolled tobacco leaves was "sik'ar" from which the words 'cigar' and 'cigarette' both derive. Fact 7: Who invented Cigarettes? The practice of using tobacco spread to other Mesoamerican societies, into Mexico and then north into the Native American tribes of North America. Fact 8: Who invented Cigarettes? The first European to encounter tobacco was Christopher Columbus when "Certain Dried Leaves" were received as gifts from the native Arawak people of Hispaniola. Christopher Columbus saw no value in the "Certain Dried Leaves" and threw them away. Two crewman of Columbus, Rodrigo de Jerez and Luis de Torres, went to Cuba and are generally acknowledged as the first Europeans to observe smoking. Fact 9: Who invented Cigarettes? In 1498 Christopher Columbus visited Trinidad and Tobago, naming the latter after the native tobacco pipe. The Spanish and Portuguese explorers introduced tobacco to Spain and Portugal. In 1586 Sir Walter Raleigh arrived back in England from the settlement on Roanoke Island and introduced tobacco to England. Fact 10: Who invented Cigarettes? Tobacco was unknown in Europe until the Age of Discovery when explorers discovered the New World. Europeans were unfamiliar with smoking and were amazed when they encountered it for the first time. Such a situation was famously and hilariously parodied by the American comedian Bob Newhart in an imaginary telephone conversation with Sir Walter Raleigh about the discovery of tobacco. Fact 11: Who invented Cigarettes? In 1609, colonist John Rolfe became the first settler to successfully grow tobacco at Jamestown in Virginia and the first shipment of tobacco was sent from Jamestown to England in 1614. By the 1680’s Jamestown was producing over 25,000,000 pounds of Virginian tobacco per year for export to Europe. Fact 12: Who invented Cigarettes? Tobacco was the biggest of all the trade exports during the Colonial period and the Southern slave plantations that produced tobacco were highly profitable. Tobacco imports from Virginia and the Carolinas continued throughout the 17th and 18th centuries. The demand for tobacco increased, and the habitual practice of pipe smoking and taking snuff became widely accepted across Europe. Fact 13: Who invented Cigarettes? Christopher Columbus had claimed Cuba for Spain and cornered the trade in cigars across Europe and Asia. The wrapper, filler and binder used to make cigars were made from three types of tobacco leaves that were all produced in Cuba and the Spanish maintained the monopoly on cigars until 1817. Fact 14: Who invented Cigarettes? The earliest forms of cigarettes were similar to the cigar and used various plant leaves to hold and wrap tobacco. During the early 1800's Spain, fine paper, called 'papel' in Spanish, was substituted for the leaf wrappings producing the first paper-wrapped tobacco, called papelate. Fact 15: Who invented Cigarettes? Papelates were exported to France where they were called cigarettes, a diminutive of the word cigare or "cigar". Fact 16: Who invented Cigarettes? Juan Nepomuceno Adorno (1807-1880) of Mexico invented a range of inventions from weapons to accounting devices. In 1847 Juan Nepomuceno Adorno was the first to patent a cigarette machine, although it was never a commercial success. Fact 17: Who invented Cigarettes? The inventor of the first commercial cigarettes, Washington Duke, was born on December 18, 1820 in Orange County, North Carolina, United States and died on May 8, 1905. Fact 18: Who invented Cigarettes? Washington Duke, a veteran of the American Civil War (1861 - 1865) had received tobacco as part of the rations given to soldiers and had witnessed both Confederate and Union soldiers rolling cigarettes for the first time. Fact 19: Who invented Cigarettes? Washington Duke returned to his 300 acre farm, in the tobacco-rich state of North Carolina, and decided to abandon farming in favor of tobacco manufacture and started his first company, "W. Duke and Sons". Fact 20: Who invented Cigarettes? The company first started producing pipe tobacco because hand rolling cigarettes was slow, time consuming and unprofitable. This changed in 1880 with the invention of the first cigarette rolling machine and "W. Duke and Sons" went on to achieve great success as a manufacturer of cigarettes and would become known as the American Tobacco Company. Fact 21: Who invented Cigarettes? The inventor of the first cigarette rolling machine was James Albert Bonsack (1859 - 1924). James Albert Bonsack of the county of Roanoke and State of Virginia invented his "cigarette machine" in 1880 and patented his invention. The patent was given on March 8, 1881 (US Patent Number 238,640). Fact 22: Who invented Cigarettes? The Bonsack cigarette machine uniformly fed and distributed tobacco on a continuous paper ribbon into a continuous roll, pasted paper around it, and cut into definite lengths. Bonsack's cigarette machine was able to produce 12,000 cigarettes in 1 hour, 200 cigarettes per minute and revolutionized the cigarette industry. Fact 23: Who invented Cigarettes? James Bonsack went into business with Washington Duke's son, James "Buck" Duke and built a factory that made 10 million cigarettes their first year. The American Tobacco Company became the most powerful tobacco company in the United States until the early 1900's when other companies like the Philip Morris company which launched its Marlboro brand of cigarettes in 1902. Fact 24: Who invented Cigarettes? The production of Cigarettes increased during WW1 (1914 - 1918) when US soldiers were given free cigarettes every day. The same happened in WW2 (1939 - 1945) and marketing campaigns at home began to target women with their cigarettes. The sale of cigarettes went up to 300 billion per year and smoking cigarettes became both acceptable and fashionable for the next twenty years.. Fact 25: Who invented Cigarettes? In 1964 the Surgeon General of the U.S. produced a report about the dangers of cigarette smoking stating that the nicotine and tar in cigarettes cause lung cancer. The Cigarette Labelling and Advertising Act was passed in 1965 from which time cigarette packs carried a warning label stating "Cigarettes may be hazardous to your health." Fact 26: Who invented Cigarettes? New brands of cigarettes were introduced in the 1980's with lower amounts of tar and nicotine in an attempt to increase sales. The government continued its war against the dangers of smoking cigarettes requiring more stringent packaging, increasing taxes, banning smoking in public buildings, restaurants, cinemas, theaters and various forms of transport including airplanes and totally banning the advertising of cigarettes. Fact 27: Who invented Cigarettes? Hon Lik, a Chinese pharmacist and inventor is credited with the invention of the modern e-cigarette (electronic cigarettes or "vapors") in 2003 and 'vaping' has been used as an alternative to smoking cigarettes. Who Invented Cigarettes - Washington Duke - James "Buck" Duke - James Albert Bonsack - Inventor - Invention - Definition - Meaning - Famous - History of Cigarettes - Cigarettes Timeline - Innovation - Significant - Development - Miscellaneous - First - Definition - Kids - Facts - Information - Info - Who invented Cigarettes? - Washington Duke - James "Buck" Duke - James Albert Bonsack - Dates - When - Why - Impact - Purpose - Use - New - Old - Cigarettes Definition - Meaning - History - Timeline - Who Invented Cigarettes?